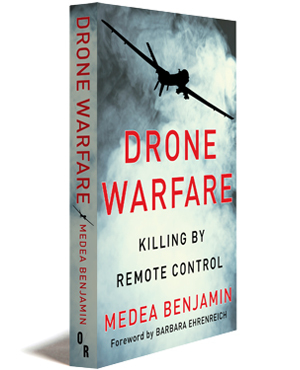 Medea Benjamin is one of America’s best-known 21st-century activists. 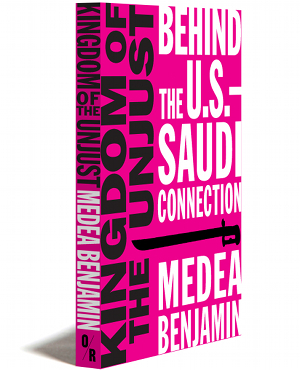 Co-founder of CODEPINK and the fair trade advocacy group Global Exchange, she is the author of Drone Warfare (OR Books, 2012) and Kingdom of the Unjust: Behind the U.S.–Saudi Connection (OR Books, 2016) and has played an active role in the Green Party. A frequent contributor to Alternet, she has a Master’s Degree in both public health and economics. In 2012, she was awarded the U.S. Peace Memorial Foundation’s Peace Prize; she is also recipient of the 2014 Gandhi Peace Award and the 2010 Martin Luther King, Jr. Peace Prize from the Fellowship of Reconciliation. She is a mother and grandmother, and currently lives in Washington, D.C.